Photo: Nigel Parry/CPI. Grooming by Asia Geiger/Celestine. It’s four o’clock on a Thursday in the barroom of the Breslin, a grand meaty pub with animal heads and medieval chandeliers. A man in his forties appears to be interviewing a brunette in her early twenties. He has a résumé in his hand and every time she looks down at her red wine he looks at her chest. Beside them, a young man with a popped collar reads the new William Gibson over a Guinness. A blonde in pearls and a man in a suit sit across from each other at one of the communal bar tables, their laptops back-to-back like a game of Battleship. The Breslin, opened last year in the terribly cool Ace Hotel, is the fatter, vested brother of the Spotted Pig, run by the same snout-and-jowl duo, Ken Friedman and chef April Bloomfield. 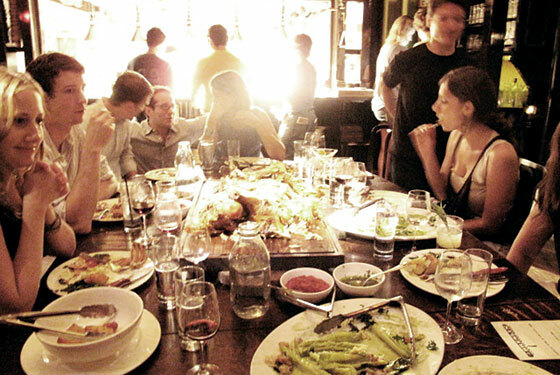 In the span of just seven years, Bloomfield has helped change the way we eat—in bars, without tablecloths, with fatty ales and laptops for friends, relentlessly local, laid-back and coolly casual but still epicurean and expensive. Inside the Breslin’s kitchen it’s breathlessly hot and smells like fresh sausage. A pig’s foot swivels heavily in a pan, waiting for its local radishes. Pools of fat bubble inside curling tongues of bacon. A tattooed redhead is screaming orders. Another gruff girl shouts, “Give me your Microplane please, right now! Right now!” as though this were an adventure film and the Microplane is the rope off the edge of the cliff. Among the punk soldiers in white coats, Bloomfield is quietly tossing a kale salad. Wearing loose jeans, clogs, and no makeup, with her strawberry hair in a bun, she floats around the room, tasting things quickly and unobtrusively, like a squirrel. She tops the lamb burgers with their sourdough hats, plucks fries from one tin and bequeaths them to an order with less. As her soldiers yell and shuffle and grate the life out of a wedge of Parmesan, Bloomfield is serene and diligent and almost meek, as if she were not the woman they are all trying to please. Legend goes that when Ken Friedman was looking for a chef to helm the Spotted Pig back in 2003, he enlisted the help of his friend Mario Batali. Batali told him if that Bloomfield was the right person for the job, he would be able to tell him so in ten minutes. The two men took Bloomfield on a food tour of New York, from pizza to dumplings, and sometime in between Batali gave Friedman a thumbs-up behind Bloomfield’s back. Bloomfield’s cookbook, A Girl and Her Pig, comes out in 2012, but beyond that and a few odd interviews and TV appearances, she keeps her head in her pots. She’s in the kitchen at the Pig on some nights, the Breslin on most others, and getting the new John Dory Oyster Bar (also in the Ace) ready for opening in early November. She also maintains a food-exchange program with father of head-to-tail eating Fergus Anderson of St. John—they switch spots on occasion to keep up with each other’s shore. Her actual cooking is marked by careful study of French and Italian classics but with an infusion of the trotters and things she grew up with, so that she ends up taking some thick British beasts and coddling them in delicate pea shoots and springy beans. Take, for example, the epiphany she had at the River Café, which involved a walnut pasta that was so damn simple—just lots of fresh seasonal stuff—but that taught her you don’t need to do a lot if you have great ingredients. “It was the most amazing thing I’d ever eaten. It was like someone had hit me in the head with a great pan,” she says. “It shocked me into another palate level, and it made me question what I had been doing for the last ten years.” She wanted to re-create that feeling for her diners. On a Friday morning in early fall, as Union Square shakes off the city and becomes a harvest wonderland, Bloomfield is weaving through the stalls, seeing what looks good and ripe and cool. After a run-through, she texts her foragers and tells them what to buy. She stops to take a picture with her iPhone of a beautiful clump of lavender. Then a mass of strawberries. 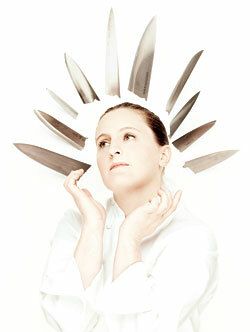 “All chefs have pictures of food in their phones, stuffed pig’s ears and pigs’ heads and the like,” she says. At Berried Treasures, her favorite stand, she runs into one of her pigtailed foragers. These is a coterie of young people with backpacks and bicycles who find fresh local produce and bring it to her like offerings to a queen. Before Bloomfield, and chefs like her, these kids might have been shelving books at the Strand, or caressing vinyl at Kim’s Video. Now they will bike back to the far reaches of Brooklyn with their newfound food acumen, and an obsession with mustard greens will be spread like indie music. Here comes Scott, who has been charged with looking for a swath of farmland in upstate New York or New Jersey so Bloomfield can grow her own produce. It’s all part of the ongoing race to do everything yourself, to grow tomatoes as close as physically possible to where you cook them. If they could, chefs would plant seeds in their wrists so they could web-sling marjoram directly into their cast-iron pans. At the next stand, where Bloomfield is impressed with the green vibrance of peppers, she runs into Trevor, a chef of Blue Hill. He’s wearing a Prosciutto e Uova Verdi T-shirt, and vaguely they acknowledge their roles in the restaurant firmament. This is the yawning early-morning conference call, when the food aristocracy comes to snap off a husk cherry and determine its debut in a salad tonight, and then later, its sudden manifestation in the collective food brain. Soon, bearded Park Slopers and Lululemon’d Upper West Side mothers will chant to the overwhelmed shelvers in their local Whole Foods: husk cherry, husk cherry. Bloomfield’s favorite season is fall and she loves the sight of a good squash. Gourds! She loves gourds, such an American cuteness. And that over there, on flagrant display like Wilbur at the fair, is what Bloomfield refers to as a puff ball. It’s a mushroom the size of a human head, which she has never seen in this country. “I’m so excited,” she says, and she bends down to smell it, press it, love it. She sticks her fingers in its deformed holes like she’s going to bowl it. Fidgety when she is in a seat talking about herself, Bloomfield has a typical British reserve, and lately she has gotten a bit sensitive to being characterized as the offal chick, the woman splaying a pig into its many comestible parts. Pig’s feet and pig’s ears aren’t on her menu because they’re trendy, she says, but because that’s what she grew up with. If there is a gentle condescension to the way male chefs talk about her—the sweet offal girl who runs the place at which the terribly serious male chefs can get some fries late at night—she doesn’t let it get to her. Not a lot does. Bourdain says she’s so good that “she can get away with running the hottest restaurants in town.” He means that coolness can detract from the food, but she is too uninterested in the perks of running a hot restaurant to let that happen. Back in the barroom, it is six o’clock. The man in his forties and the girl in her twenties have fingered their way to the bottom of a bowl of boiled peanuts fried in pork fat. As they get up to leave, the young girl signs the bill and takes the older man’s résumé, and she thanks him for his interest.